Bus parking is located at Innovation Park. Directions to Bus Parking: From 933 and Angela Blvd, go east on Angela past Eddy Street and take the second right onto Leahy Drive into the Innovation Park Lot. Follow directions of Parking Attendants. Groups arriving in bus caravans with five (5) or more buses arriving at the same time should contact the Athletic Department Ticket Office at (574) 631-7356 for additional information and to purchase parking passes ahead of time. All RV Parking on game day is allowed only from 7:30 a.m. to three hours after the game, and only in the Notre Dame federal Credit Union Lot. Directions to RV Parking: From exit 77, for RVs, proceed north (left) on State Road 933 to Cleveland Road, then east to Juniper, then south to the Notre Dame Federal Credit Union. WE are an Chicago Land most experienced provider of tailgate services for Notre Dame home games in South Bend IN. We have been to ever home game last 3years. This rate does not include the parking pass ($350) This pass must be paid the day of the event to the guy working the lot. SPACE IS LIMITED first come first serve. WE suggest you arrive earlier than expected. WE will give you a free hour to make sure you arrive in the tailgate gate lot, Innovation Park (next to the ice area). Chicago Party Limo Bus Tailgating! Notre Dame tailgating packages!! Party Limo Bus Tailgating. WE are the Tailgating Experts we have been to every home game over the last 3 years take a look at our photos. The most experienced tailgating company in Chicago We been to every home game in the last 3 years. SOUTH BEND, Ind. 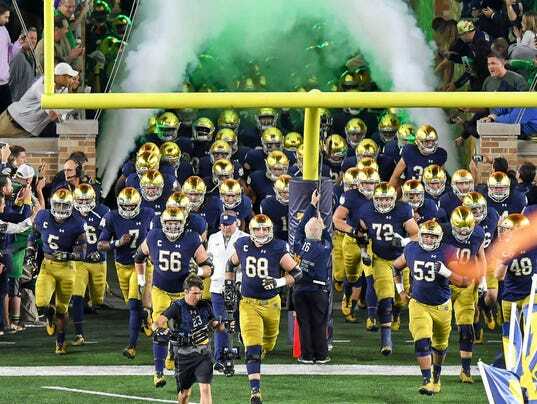 (AP) — Notre Dame announced its 2018 schedule that includes three night games at Notre Dame Stadium and a November visit to Yankee Stadium to play Syracuse. The Fighting Irish begin the season with three straight home games, starting with a Sept. 1 prime time visit by Michigan. Stanford (Sept. 29) and Florida State (Nov. 10) also visit Notre Dame Stadium for evening kickoffs. Notre Dame’s television agreement with NBC has an option for five night games over each two-year window. Notre Dame played Georgia and Southern California in evening games this year. The game against Syracuse at Yankee Stadium is set for Nov. 17. It is the ninth in Notre Dame’s Shamrock Series, where the Irish play a scheduled home game at a neutral site. Notre Dame has played 26 times at the home of the Yankees. Next year’s regular-season finale at Southern Cal is a week later, on Nov. 24.